This four star hotel near Cirencester enjoys a stunning location in the heart of the Cotswolds yet only 20 minutes from junction 15 of the M4 and junction 11A of the M5. Providing luxury Cotswold accommodation, the hotel has been designed to complement its surroundings, while retaining all the features of a premier four star hotel. 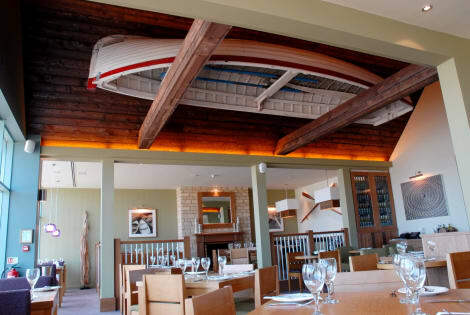 It offers 318 en-suite bedrooms, a superb Brasserie with a lakeside view, separate gastropub and luxury spa. Make yourself at home in one of the 25 guestrooms. Complimentary wireless Internet access keeps you connected, and digital programming is available for your entertainment. Bathrooms have shower/tub combinations and hair dryers. Conveniences include phones, as well as desks and coffee/tea makers. Featured amenities include complimentary newspapers in the lobby, dry cleaning/laundry services, and a 24-hour front desk. This hotel has 8 meeting rooms available for events. Pamper yourself with a visit to the spa, which offers massages, body treatments, and facials. Additional amenities at this hotel include complimentary wireless Internet access, wedding services, and tour/ticket assistance. With a stay at Waggon & Horses in Cirencester, you'll be minutes from Church of St John the Baptist and New Brewery Arts Centre. This inn is within close proximity of Cirencester Church and Cirencester Parish Church of St John Baptist.Rooms Make yourself at home in one of the 4 guestrooms.Amenities Take in the views from a garden and make use of amenities such as complimentary wireless Internet access.Dining Enjoy a satisfying meal at a restaurant serving guests of Waggon & Horses.Business, Other Amenities Featured amenities include complimentary high-speed (wired) Internet access and luggage storage. With a stay at The Bathurst Arms in Cirencester, you'll be minutes from Cerney House Gardens and close to Cirencester Golf Club. This inn is within the vicinity of Le Spa at Stratton Place and Cirencester Parish Church of St John Baptist.Rooms Make yourself at home in one of the 6 guestrooms. Complimentary wireless Internet access is available to keep you connected. Bathrooms with showers are provided.Dining Full breakfasts are available daily for a fee.Business, Other Amenities Free self parking is available onsite. Take in the views from a terrace and a garden and make use of amenities such as complimentary wireless Internet access. This hotel also features wedding services, a fireplace in the lobby, and a picnic area. The largest town in the Cotswolds, Cirencester is an attractive market town on the banks of the River Churn in Gloucestershire. The town has an important Roman history, and at one point, under Roman rule, it was the second largest town in England after London. Book one of our Cirencester hotels and explore a town full of culture and interest. Cirencester has a range of independent shops selling everything from clothes and gifts to antique clocks, as well as some chains and a House of Fraser department store. The M.A.D.E. Makers' and Designers' Emporium sells home accessories, cards, gifts, artwork, kitchenware, socks, jewellery, toiletries and toys made by hundreds of artists and artisans. Lick the Spoon's chocolates have been stocked by Harrods, Harvey Nichols and Selfridges, and their luxury Easter eggs have been praised by Nigella Lawson. There are markets six days a week in the Corn Hall - homeware, fashion and garden accessories from Monday to Thursday, antiques and jewellery on Fridays, and art and craft on Saturdays. There's also a food market, Cirencester Charter Market, in the Market Place on Mondays and Fridays. The Corinium Museum - named after the town's Roman name – has a collection of more than 40,000 objects. Here you can see Roman and prehistoric artefacts, from rings and tools, to religious sculptures, as well as temporary exhibitions. The museum also runs talks, lectures and art and craft workshops for adults and children. The town also still has the remains of its 2nd-century amphitheatre, one of the largest known. The New Brewery arts centre, housed in a former brewery, holds regular art and craft exhibitions and runs art and craft courses for children and adults. A group of artisans are based at the centre, including a ceramicist, an upholsterer, a clothes designer, glassblowers, a stained glass artist, a jeweller, a mosaicist and a weaver. You can visit their studios to see them in action and buy some of their work in the shop. There's also the Wetpaint Gallery, which specialises in modern art and has exhibited work by Sir Terry Frost, David Hockney, Henri Matisse, Pablo Picasso and John Piper. On the edge of the town is Cirencester Park, part of the Bathurst Estate, where you can enjoy walking or horse riding. Within driving distance is Westonbirt Arboretum, home to more than 2,500 types of tree from around the globe. These include a 2,000-year-old small-leaved lime, thought to be one of the oldest living things in Britain, as well as 11 critically endangered, 36 endangered and 49 vulnerable species. More well known species found here include maple, magnolia, oak, beech, cherry, horse chestnut, birch and pine. Head to Soushi for Japanese food, or the Grade II listed Corinium Hotel and Restaurant, built in the 16th century, for classic British dishes and cask and guest ales. In summer you can sit out in the walled garden. Pop into the stylish Somewhere Else Deli Bar for breakfast, brunch, lunch, dinner or cocktails. The restaurant offers an eclectic, weekly changing menu.